Green House, Good Life: "Your Meter is Running Backwards Right Now"
That's the text message I got from our solar installer yesterday afternoon as he was testing our solar system. (Calling it our "solar system" sounds a little, uh, bigger than it really is, but you know what I mean.) He has told me that that's his favorite part of his job -- finishing the installation and attaching his tester tool (which makes the connection between the panels and the house's electrical system before the solar meter is installed to do that permanently) to finally set the system in action and start generating power (albeit very temporarily). 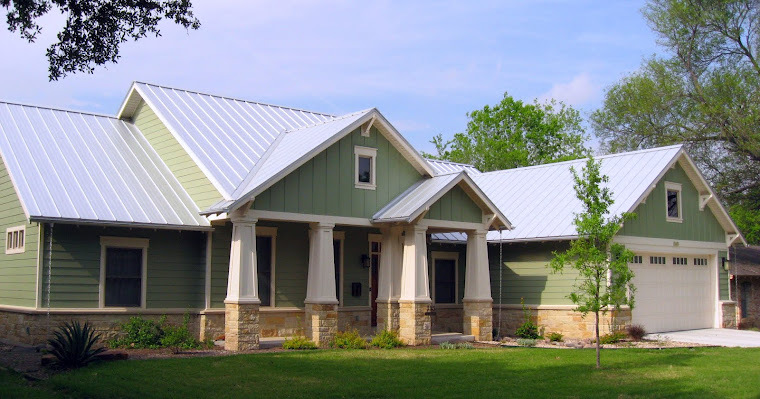 That causes the electric meter to slow down -- since solar energy reduces the house's draw from the power lines -- and when the system generates more power than the house is using, the meter actually runs backwards. (To clarify, when everything is finished, we will have two meters: the solar meter and an ordinary electric meter. 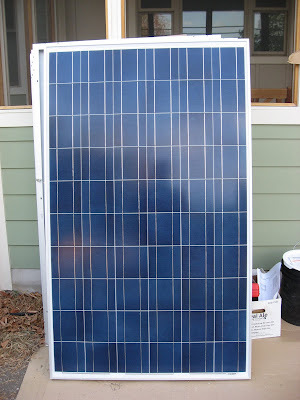 The solar meter connects the solar system to our house's electrical system and will display an ever-increasing total of the energy the system has generated. The regular meter counts how much energy we've taken from the grid, and since we're now going to be putting electricity back into the grid at times, it will count up when we use more than we generate and down when we generate more than we use.) Unfortunately, I wasn't home to see the meter count down (hence the text message), but it's still nice to know the system is finally to that point. And maybe we saved a few cents in electricity while he was testing it. But let's back up. Earlier this week, they were midway through installing the panels. They're all up now and all of the electrical work is finished, so we're just waiting for our inspection and the solar meter to get our own little power plant up and running. So after about a month of delays due to installation hiccups, it's great that they're finally up. But...have I mentioned that we're not patient people? So right now, waiting for our solar meter, is difficult for us. We went with Schuco, a German panel. 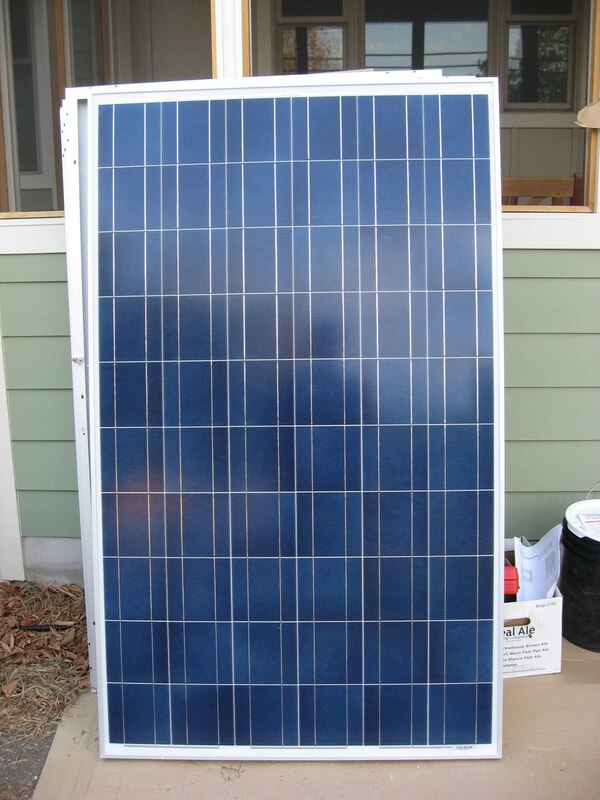 Another brand our installer has used is Yingli, which is Chinese. Both panels are 235-watt panels, but they prefer Schuco because they're made with better tolerances. 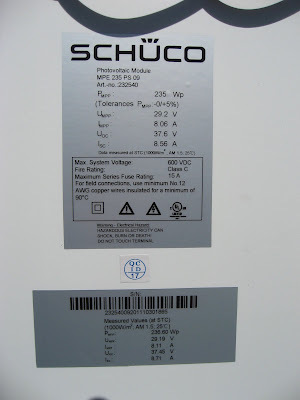 Yingli panels are 235 watts, plus or minus 3%, but Schuco panels are 235 watts, plus 5% (no minus). So the power output of Yingli panels can vary from about 228 watts to about 242 watts, while Schuco panels are always at least 235 watts and can range up to about 247 watts. Each panel is individually tested; the one shown below happens to be 236.6 watts (as you can see from the bottom sticker). As kind of a language nerd (and environmental geek), I like how what I assume was originally an umlaut above the "U" in Schuco became rays of sunshine in their logo. ...And for the time being, we're going to have to satisfy ourselves with umlaut-sunshine and the (questionable) aesthetic value of our panels. (Sigh.) I'll let you know when the plant opens for business.